Trixie has passed on since last post. Got 3 new baby boys. Dexter, Toby and Sam. Just an small update on my babies. Sam is doing fine alone. He does get a little bored. He recently started purring when we take him out to play. Bud is thriving on being alone. Not at all depressed. Spot and Little bear now a tad over 2 years old. Starting in the senior realm of gerbils. Spot recently started jumping into my hand and climbing onto my shoulder without any bribery. Little is starting to do the same. Toby and Dexter are doing just fine. We still need to work with Dexter more. Still a little skittish. Toby is as friendly as he can be. Mona and Simone are also a little over 2 years old now. Simone still has her nose problem but it is under control. Mona is now a good friendly gerbil. I can pick her up with no problem. Simone loves to be picked up. Fred the Hamster is now abut 1.5 years old now. He is still going just fine. Still loves his ball. Loves to be brushed. With his long hair. He needs it. Holly Robinson Cookson appears with copies her brand-new book, The Gerbil Farmer's Daughter, which tells the story of America's largest and most successful gerbil farm. Kirkus Reviews writes: "Journalist Robinson cheerfully recalls growing up with a closeted gerbil-breeder....It’s a scenario that could have been lifted from a 1960s sitcom, but Robinson invests the narrative with pathos, good-natured moments of absurdity and plenty of keen humor....Daffy yet sweet and affecting." A remarkable story in the history of our beloved pets told with sparkling humor and affection! In order to better serve the traditionally large public turn-out, we will break the Pet Class into two segments. The morning class (11:30 am-12:30 pm) is targeted toward younger children (ages 8 & under) and uses our traditional "Best Whiskers" format to acknowledge the things that make each gerbil special with a blue ribbon for every gerbil. The afternoon segment (1:30-3:30) will feature a Mock Show for gerbils owned by kids ages 9 & up. Trained AGS Asst. Judges (youth members ages 11 and up who have taken Judges' Training) will award 1st, 2nd and 3rd place Pet Class ribbons to pet gerbils, judging them by color class using the AGS Standards, exactly like the breed show. The Jr. Judges will describe the characteristics of the winning gerbils. This mock show will be an excellent chance for older children interested in showing gerbils to learn what makes a winning gerbil in a less-competitive, educational event. Can't come to the show in person? Send in a photo of your gerbil and we'll let the visiting public choose a winner! Beautiful craft items, useful gerbil supplies, adorable novelties and more, to benefit the AGS! In past years we have had wonderful items from books to jewelry to quilts to gerbil supplies. Rebecca Azer of Gerbil Parade will speak about rabbit care and the joy of owning a bunny. Meet Elvis and hear all about how much a fun a bunny can be! Has anyone seen a knitted hamster pattern toy/stuffie? I have been looking all around and came up with nothing. I would love to be able to make some for the upcoming gerbil show at the end of the month. I will be bringing my knitted gerbils, rats, guinea pigs and hedgehogs. I am going to try this challenge. It will be my first one. Are you planning on coming to the gerbil show in Nashua NH in May 2008? The American Gerbil Society's 2008 New England Gerbil Show is rapidly approaching! This year's show will be in Nashua, New Hampshire and takes place on May 17th. Gerbil breeders and owners from around the country will be at the show to show off their gerbils, sell gerbil merchandise, and even adopt out gerbil pups! It's a great opportunity to learn more about gerbils. 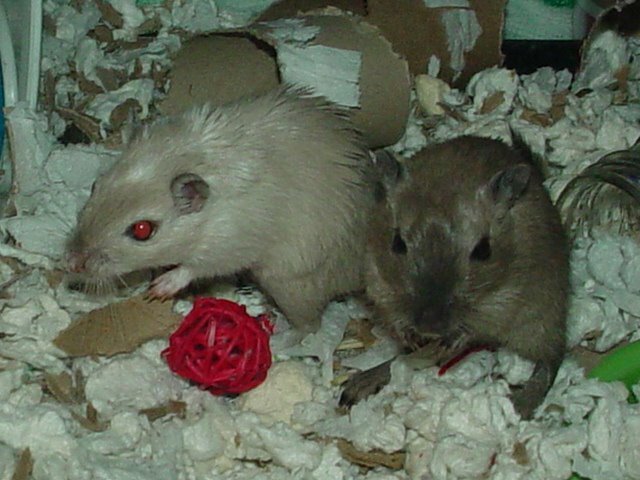 AGS members can also enter their gerbils in a gerbil show (just like a dog show, except with gerbils). Although judging occurs behind closed doors, at the end of the show, winners are announced. There is a wonderful pet class where kids can bring their pete gerbils and compete for fun. Prizes awarded for best chewer, shoulder sitter and lots more. Click the link above to learn more about the New England Gerbil Show. Hope to see you there! I will be there showing off my two little girls Simone and Mona. I will also be selling my knitted rodent merchandise (rats, gerbils, mice) in honor of the Chinese Year of the Rat. My little gerbil Honeybear passed away recently. I have got 4 new babies with now a total of seven gerbils and one hamster. Buddy will be paired up with 2 baby boys and 2 baby girls will be pair together. A petz 5 site loaded with adoptions, litters, freebies, rescues, shows and lots more. We also have wildz like hamsterz, fancy ratz, gerbilz. Add your site in Free for All Links. Win my site award.